I cannot get over how loving both Sammie and Bettinna are. Wow. I came home today and Bettinna couldn’t get enough of me and same for me. She lied on the couch and exposed her belly and I kissed her belly and under her chin and everywhere as well as petting her and she was in heaven. This went on and one for quite a while. Wow! 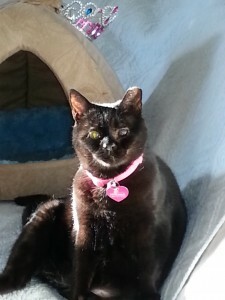 Sammie always loves to be pet, but you cannot be as free with her due to her abused issues. However so loving the same. The best thing in the world. I also posted a new video of Bettinna looking in the mirror. Trying to figure out if that is her or is there a cat behind the mirror. I wonder if she has that sense of self. Do your cats wake you up in the morning. Bettinna starts at 5 a.m. every hour. Comes and rubs the part under her chin all over my head and hair. She is a Mommy’s girl and prefers me over my husband. They say the cats prefer one person. She doesn’t seem to let things bother her. She is so good natured, she does not want to hurt anyone or anything. When she plops down on the floor, especially when I first come home, she wants me to pick her up. When I get close to her, especially in the mornings, she rolls over, closes her eyes in anticipation. Just the joy of what she feels for me and I to her just overwhelms me with astonishment, joy, love and emotions I cannot express. 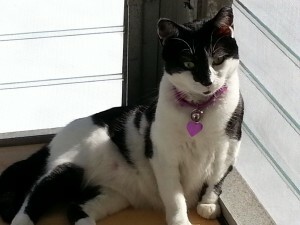 To think, she was left outside and this amazing personality gets to be enjoyed. So many cats outside, could give this kind of love and life joy, it upsets me when I think of it. It upsets me when I think of the people who don’t think these animals are functioning living beings who have lives, feelings and can give to our species the humans. I remember people thinking cats can be hiding under the bed or behind couches and think this is normal cause they are cats. Well, know I know differently. It is because they are feeling scared, had trauma or still experiencing tramau. 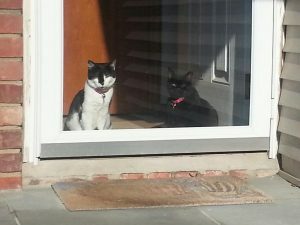 I had no idea before I rescued my two cats. Sammie has come such a long way. I am blessed that the two of them get along. Yes they fight, but people told me their cats fight even if raised together. She used to favor me at first, until I left for a week. She held a grudge for 6 months. I started to feed her to have time with her and it worked. She favored my husband for a long time. Now she does not seem to favor either of us. In fact, I take time to pet her. She lets us know by running towards one of the beds where she likes to be pet. She is so excited. I feel bad when I am just walking around and she misinterprets this. So sometimes, I just spend the 5 minutes to pet her. This gives her confidence and keeps her happy. It really does show. Bettinna is quite smart to interact with us. Bringing us her toys, picking out her toys to play with. She loves to watch out the window. 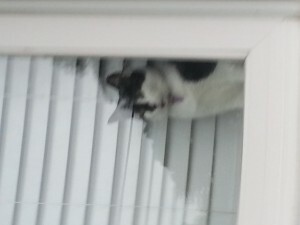 She uses her face, head and paws to open the blinds. She eats too fast so I have a few types of feeder toys that she has to remove the top to get to the food, or forage amongst obstacles to eat. Sammie is a slower eater and likes to take breaks, so I have to watch both of them as Bettinna likes to eat all the food. She tends to try to cover the food still today as she must have done outside to save food for herself. Sammie’s new thing is she took over the bed sleeping with Daddy and Mommy where Bettinna loved to sleep with Mommy. Sammie prefers Daddy, but does ask me to pet her and brush her many times. 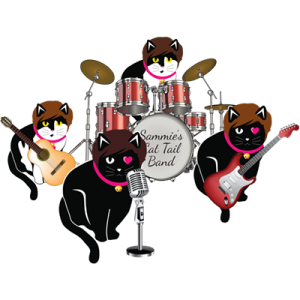 We learn their body language and especially Sammie’s to know what she wants. She gets so excited a bedtime and no matter where she is in the house, Daddy calls her to bed and she comes and sleeps next to his face. The odd time she comes over to our heads and breathes on us and licks our nose. Wow. So cute. Bettinna does this with me often and when she wants me to wake up like today, she kept rubbing herself on my head. When I wake up in the morning, Bettinna loves me to pick her up and she curls up in a ball like a baby and I walk and rock her and kiss her. She loves to rub her scent under her chin on me and with me on my bed or wherever we are first thing in the morning. When I come home or when she prefers, Bettinna flops down right at my feet. I could hurt her and step on her and have learned to be careful. This means pick me up Mommy. Well, Sammie and Bettinna seem to be BFFs, but also they seem to be fighting. I think they challenge each other to see who is alpha. Sammie is the boss usually. Sometimes when they play or fight it seems so rough, they bang against the walls and then Bettinna or Sammie yelps out. Sigh! Lately this goes on every morning before I feed them. One day I see Bettinna on top of Sammie. Usually Bettinna lies down and Sammie is on top. Well thenext 3 days I thought something was wrong with Sammie. I figured she was no longer dominant. She sulked around the house, her tail was low, she slinked around like she was afraid, she did not eat much. Which is definitely not like her, as she loves her food. She sulked before when I left for a few days during our earl days together. I guess this is part of her personality. Thank goodness she came out of it. It is interesting, but they are my kids, and I am so tuned in to them and them to us. Wow. 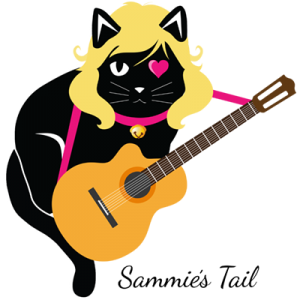 I have a new logo for the shop as since we are so musical I thought it would be good to have a guitar and a star hair doo on Sammie. Bettinna’s is coming shortly. Anyway, mostly they get along, they eat each others food. But without low snarls and growls they must be playing and/or doing the territory conquer thing.